Today we will be exploring 9 types of soil remediation methods. Remediation comes in many forms to battle all the problems of soil contamination. There are two main methods, they are known as “ex-situ” and “in-situ”. Ex-situ involves digging up the affected soil and then treating the soil from the excavated surface. While In-situ methods try to be less invasive and treat contaminated soil without removing any dirt. Thermal desorption is a soil remediation method. During the process a desorber removes contaminant such as oil, heavy metals, or hydrocarbons out of sludge, or other contaminated soil. After the contaminants are collected they are thermally destroyed. These thermal treatment centers are usually called offgas treatment systems. Excavation is simply digging up contaminated soil and hauling it away to a landfill. If the soil is contaminated is usually treated with an aeration method. If the bottom of a lake or river is found to contain volatile organic compounds it will be dredged. Generally there is some type of chemical oxidation method that treats the contaminated soil. Surfactant enhanced aquifer remediation – S.E.A.R. SEAR is also referred to as Solubilization and recover requires the Surfactant Enhanced Aquifer Remediation process. This involves a trained specialist inject a special liquid into the ground. These liquid surfactants are hydrocarbon mitigation agents and they enhance desorption and recovery hard to reach contaminants within the soil. Pump and treat involved removing ground water with a massive vacuum pump. This pump then sends the contaminated groundwater into a series of purification processes. Usually these vessels are filled with materials known to treat the active contiminants. For instance, oil contaminated, they usually use granulated activated carbon, the same active ingredient in your tap water filters. Think of it as a huge Brita for groundwater. Solidification and stabilization uses a binding agent to stop the flow of contaminants in soil. This method has a great track record but also has some environmental setbacks. Stabilization – involves adding chemicals or materials to the contaminated soil or sludge to produce a chemically stable contaminant. Solidification – involves adding chemicals or materials to the contaminated material to bind it and keep out air or rainfall. The long term effects of using the stabilizers and solidifiers on soil is still unknown. Also, this method is cheap and generally not overseen by any regulatory body throughout the world. In the US, regulation is better, but this is still a global environmental concern. Remediation by chemical oxidation involves injecting oxidants like hydrogen peroxide, ozone gas, or potassium permanganate into a contaminated soil area. Oxygen gas is usually injected to promote bacteria growth which accelerate the natural destruction of organic contaminants. This method is becoming popular but can easily disturb any heavy metals or contaminants that are trying to leech farther into the earth. 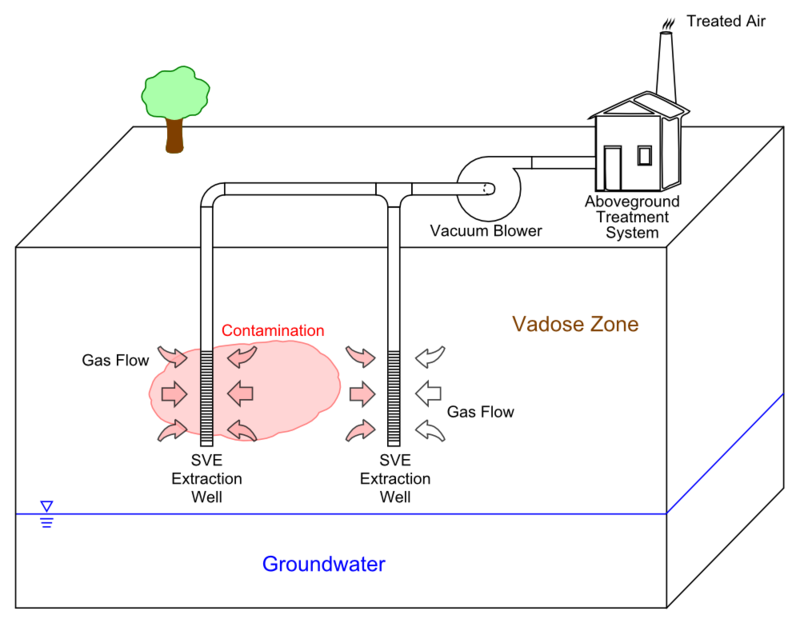 Soil vapor extraction (SVE), is known by the term “soil venting”. It is basically a way to collect the evaporated contaminants from the soil vapor. Imagine a massive vacuum above your soil while you pump air below the contaminated soil. The air you pump in also has a reagant that evaporates contaminants and then sends them up to the vacuum. Once absorbed by the vacuum the vapor is treated and contaminants removed. Using nano-sized reagents to immobilize any soil or groundwater contaminants is becoming more popular within the US. Using iron based nano-sized materials, organizations are cleaning up contaminated soil. Nanoremediation is common when removing metals such as arsenic, mercury, or lead. This method has been commercially used to treat groundwater and waste-water. One of the cooler methods, this relies on the use of biological means to treat contamination in soil and water. By using bacteria, plants, or biological compounds you can actually treat your contaminants away. Bioremediation can be used in with a pump and treat system. In bioremediation, bacteria are used to process contaminants from groundwater. Call Westside environmental today at 201.472.1030 to get an estimate on your soil remediation. This entry was posted in Construction Waste Management, Contaminated Soil, Going Green, Recycle, Soil, Trucking, Waste and tagged construction, contaminated soil, going green, Industrial Waste, nj, nj soil remediation standards, njdep, petroleum contaminated soil, Soil Remediation. Bookmark the permalink.